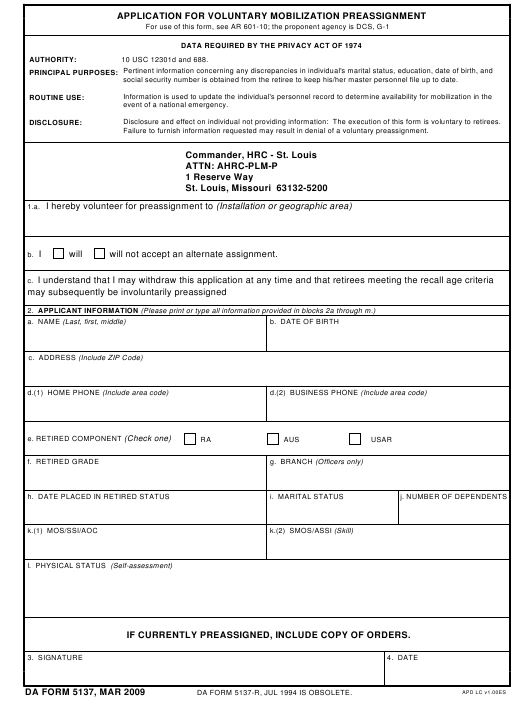 DA Form 5137 - also known as the "Application For Voluntary Mobilization Preassignment" - is a United States Military form issued by the Department of the Army. The form - often mistakenly referred to as the DD form 5137 - was last revised on March 1, 2009. Download an up-to-date fillable PDF version of the DA 5137 down below or look it up on the Army Publishing Directorate website. 10 USC 12301d and 688.
social security number is obtained from the retiree to keep his/her master personnel file up to date. event of a national emergency. Disclosure and effect on individual not providing information: The execution of this form is voluntary to retirees. Failure to furnish information requested may result in denial of a voluntary preassignment. will not accept an alternate assignment. IF CURRENTLY PREASSIGNED, INCLUDE COPY OF ORDERS. DA FORM 5137-R, JUL 1994 IS OBSOLETE.